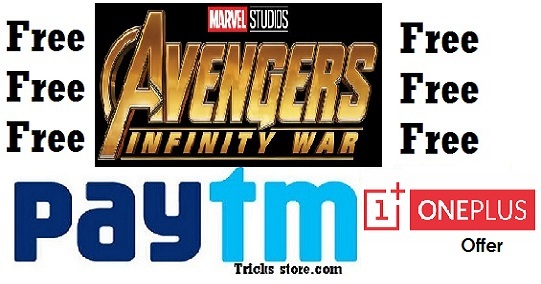 Free Movie Tickes, Avanger new movie 2018, Avangers movie ticket coupon, Avangers infinity war movie Ticket Cashback, Oneplus Avengers Offer , Avengers The Infinity War Free Tickets – After a while for which we are waiting for, Marvel’s Biggest Movie Of 2018 is going to launch on next Friday & with this Oneplus new flagship phone “OnePlus 6” is Coming. 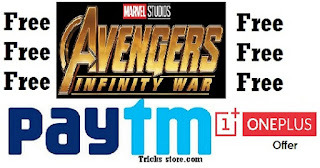 So with the collabe of these to surprises OnePlus is coming a awesome offer with Marvel by giving away Free Avengers The Infinity Wars Tickets . We all know OnePlus is going to launch it’s OnePlus 6 in India on next month on Amazon.in & OnePlusstore.in . On it’s launching occasion they are giving Free movie ticket offer in which they are giving a free Tickets + Some Snacks for Avengers The Infinity War Movie. But this offer is only available for those who have a Oneplus Phone(s). So enjoy if you have an one oneplus. 2. After that do Register your Oneplus IMEI Or login. 5. Now click on “Get it” and a new Coupon code will be generated for you. 6. After that go to Paytm and Select the Same Location and time (which you have in OnePlus Website ) and Proceed to Checkout option. 7. Now here enter the Coupon Code you got from Oneplus website . 8. That’s it you have to pay only Rs 1 as Complimentary Fees and book free tickets of avangers infinity war. * Free Avanger Infinity War Ticket will available on 26th April 10:00 AM. * You can Book Tickets in Paytm app and use this coupon to choose the movie in your city. * 1 OnePlus account can get only 1 movie ticket for complimentary along with snacks for Rs 1.